MACON, Ill. – The carnival atmosphere doesn’t stop when the state fair comes to an end, because Macon Speedway brings the circus to town with the Shrine 50 and Chuck Foley Memorial Demolition Derby on Saturday, Aug. 23. 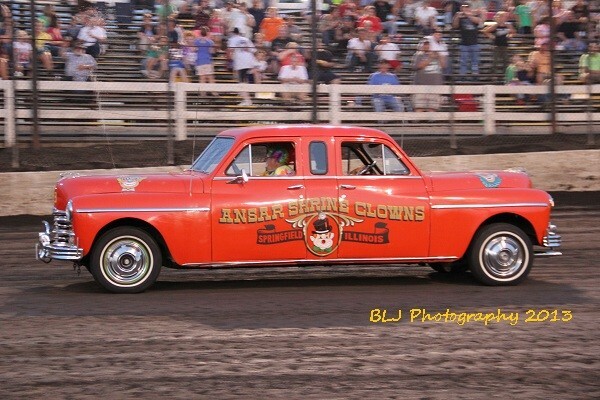 The combination of racing, demolition derby in three classes and the fun from the Shriners makes for one of the favorite nights of the year. More importantly, all money raised goes to the Shriners Hospitals for Children. The Shrine 50 is a 50-lap race for Billingsley Towing Modifieds that pays $1,000 to win. The modifieds have already thrilled everyone with some of the best racing of the season. Macon Speedway fans are still talking about the Twin 50’s held in June. There was plenty of paint traded that night and at least a few words traded in the grandstands and the pits. Big Ten Series Street Stocks also hold the ninth race in the 10-event campaign that pays $1,000 to the series champion. Outlaw Hornets and Stock Hornets also race. Now here’s an event that’s way past trading paint. For the first time in years, Macon Speedway will also host a demolition derby. With three classes, the rock ‘em sock ‘em action should shake the speedway to its foundation. The bone rattling thrills will keep fans of all ages excited and entertained. Watch the cars battle in a last driver standing match of power, speed and daredevil moves. Drivers will compete in Bone Stock, Stock and Compact divisions. Pit passes are $30 with no entry fee. For more information, call 217-306-2222. Check Maconracing.com for a complete set of rules. The racing doesn’t cool off any time soon. With the Big Ten Series Street Stocks running their final night during the Illinois Street Stocks championship, Aug. 30 is must-see stock car racing. On Sept. 6, POWRi Midgets and Outlaw Micros make their final appearance at Macon Speedway for the season with Outlaw Micros running double features. Scout Night is Sept. 20 with the season-finale on Sept. 27. Circle the calendar for the second USAC-ARCA doubleheader when the Ted Horn 100 for USAC Silver Crown cars runs Sept. 31 under the lights at the DuQuoin State Fair before the Southern Illinois 100 for ARCA stock cars entertains race fans on Labor Day. Tickets are available by calling Track Enterprises at 217-764-3200.